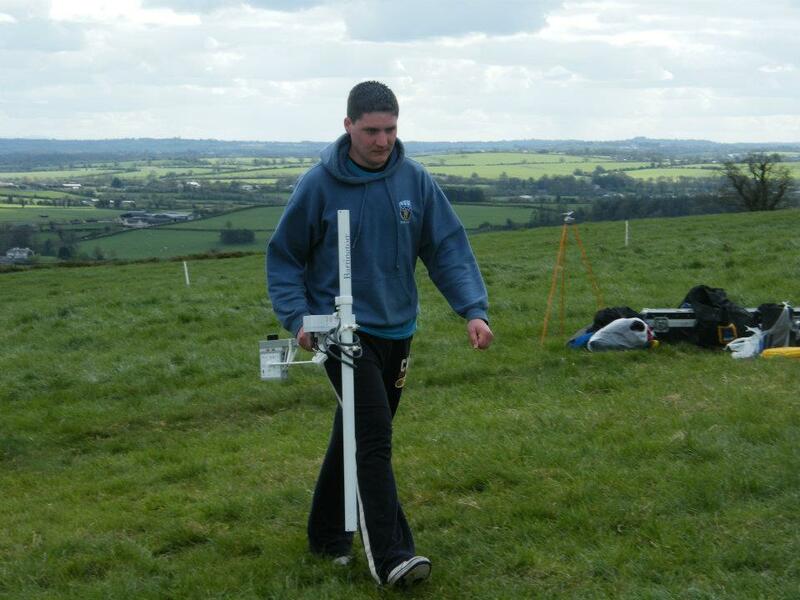 Over Easter week 2012 I had the opportunity to take part in an introduction to archaeological geophysics course on the Hill of Slane, Co. Meath. The Hill of Slane is located to the North of the village of Slane which is just outside the World Heritage Site of Brú na Bóinne. We stayed in the Slane Farm Hostel for the week, a fantastic hostel with everything you need for any length of a stay (both indoor and camping) including fresh eggs in the morning. The Hill of Slane and Slane Village is well worth a visit by anyone in the Brú na Bóinne area. There are a number of upstanding archaeological features on the hill. It is reputedly the site on which St. Patrick lit the first Pascal Fire in Ireland in defiance of the High King Laoighaire who had him arrested and brought to Tara. Here St. Patrick taught him about God and Christianity and while the King himself did not convert he allowed Patrick to continue his mission in Ireland. The course was run by Kevin Barton and Dr. Conor Brady. The course had 18 participants from 11 different countries (Ireland, Bolivia, Estonia, Latvia, USA, Poland, Greece, Slovakia, Lithuania, Finland and Germany). We arrived on Saturday the 07 April from our various origins and got to see the First Slane Festival that evening, an event organised by Slane locals celebrating their locality and it’s ties to St. Patrick. 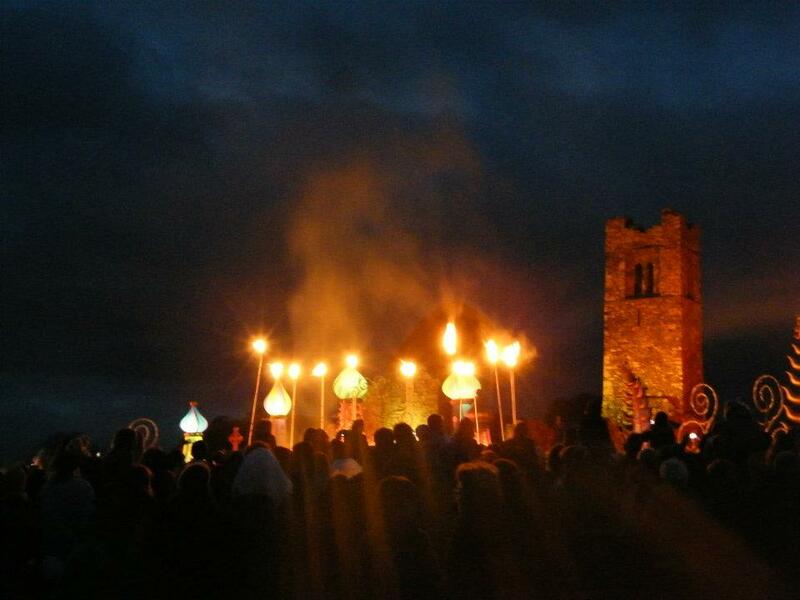 There were acrobatic and fire displays and the Easter Fire was lit before the locals paraded back down the hill with the Easter Flame for the vigil mass. 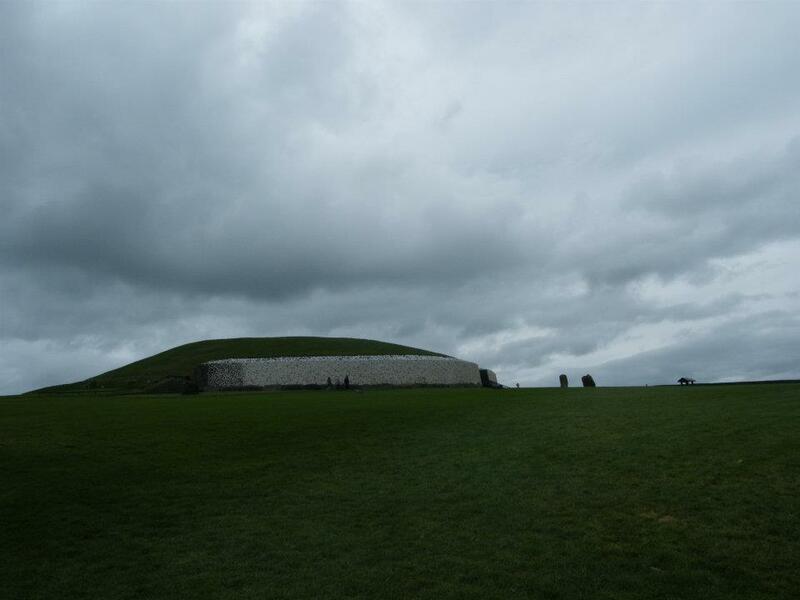 Sunday the 08 April brought a trip to the Brú na Bóinne Neolithic passage tomb sites of Knowth and Newgrange. We were provided with tours of both sites from the OPW. After the Newgrange tour, Kevin gave us a brief account of the recent survey carried out on Newgrange which aimed to search for the presence of a second passage. While the survey could not be completed, the method proved successful as demonstrated by the survey carried out on the already known passage. 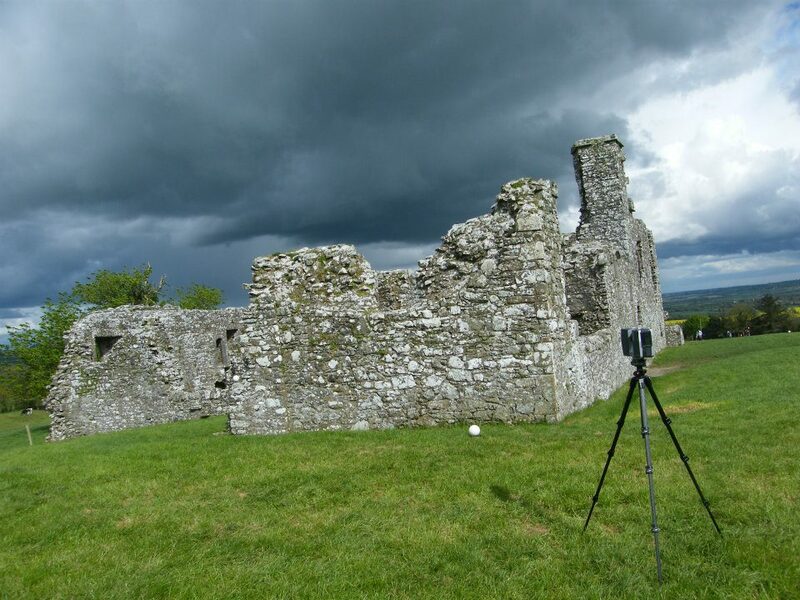 We then went to Drogheda to stock up on food for the week and followed that with a tour of The Hill of Slane led by Dr. Conor Brady who outlined the monastic site, the monastery, the Norman motte and the various anomalies which were identified through field survey and LiDAR survey. We were also introduced to the field we would be working in the following day. That evening following dinner, we had our introductory lecture and a lecture on magnetic susceptibility survey and surface collection survey from Conor and Kevin. 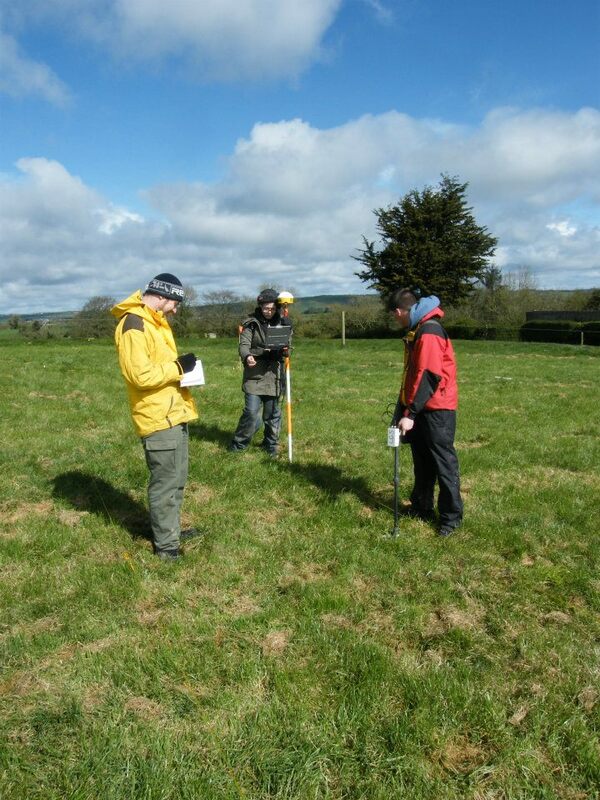 This was followed by a case study on surface collection survey through a report on the survey and excavation carried out at Rossnaree in the Boyne Valley by Dr. Conor Brady. Monday the 09 April was spent in a ploughed field on the south-west side of the Hill. For the week we were split into groups of four and each group given an area to make teaching and surveying work easier and more hands-on. 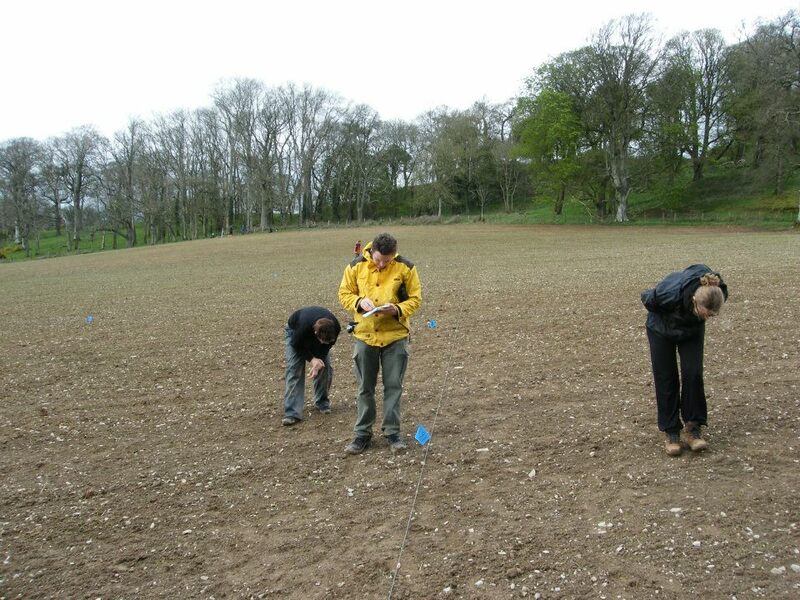 Here we practiced fieldwalking, magneic susceptibility, sub-metre GPS, metal detecting and total station use. The evening brought a lecture from Kevin where he presented the results of geophysical surveys on an archaeological site in Norway. The results of each survey were compared to one another to highlight the benefits of multi-method approaches, to show how they complement one another and to demonstrate how some features are visible in some survey results but not in others. Piotr from Poland then introduced us to the software Snuffler, a free to use programme used for processing magnetic and resistance surveys. This would be the programme we would be using for our data processing later in the week and following the field school. Tuesday 10th and for the rest of the week we remained in the vicinity of the monastic site on top of the hill for survey work. In 1997 a trench was dug for an electric cable to provide floodlights on the monuments. This extended in an east-west direction from the visitors car park to the monuments. The trench was dug about 30cm wide and 1m deep. Kieran Campbell, a consultant archaeologist monitored the excavation of this trench and noted a number of possible archaeological remains mainly in the form of stone scatters and blocks. These may be the remains of centuries of activity on the hill. Because this was only a 30cm wide keyhole no interpretations could be made. Each of these features was marked by its distance from the gate at the end of the field. Before we arrived to the Field school these spots had been identified and marked with a sub-metre GPS. A grid of ten 20x20m squares was created around the line. The line went through five of these squares with another five added in order to extend the survey. Our job was to survey these grids in our groups using the various remote sensing methods that were demonstrated to us. The aim of this survey was to identify if the features identified by Kieran Campbell extended beyond the trench. For the first day our tasks were; earth resistance, magnetic susceptibility and dumpy levels. 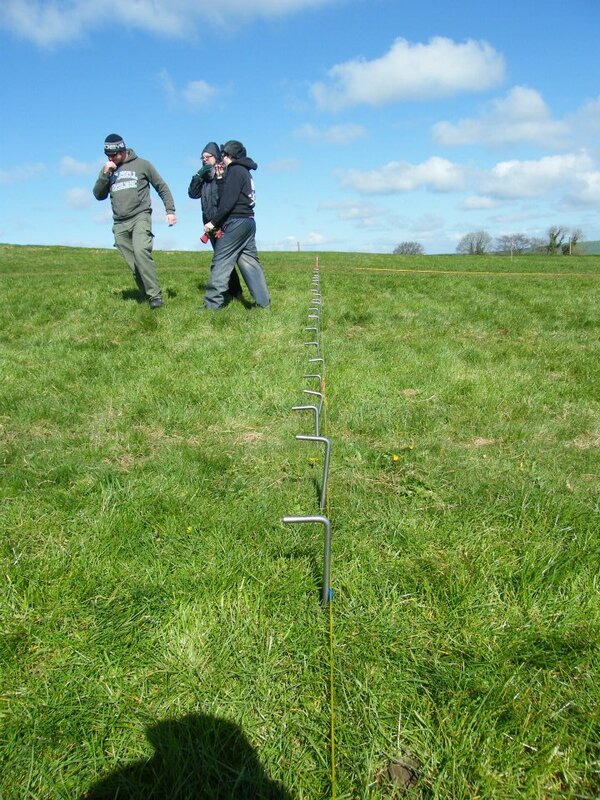 That morning we carried out an Earth Resistance survey with points taken every 50cm along transects spaced 50cm apart. After a few readings the machine decided to give up so we carried out a magnetic susceptibility survey which threw up some strange results possibly due to the volcanic bedrock which was quite close to the surface. After lunch two of us carried out a dumpy level survey while two of us practiced low-level aerial photography using kites. The evening brought with it a lecture from the Discovery Programme on their research in Ireland demonstrating their use of techniques such as LiDAR, Photogrammetry and laser scanning. Different case studies were demonstrated and varying results that can be achieved by using different approaches to the same technique were also demonstrated. They also showed some of the results from laser scans carried out that day on the College with other groups. 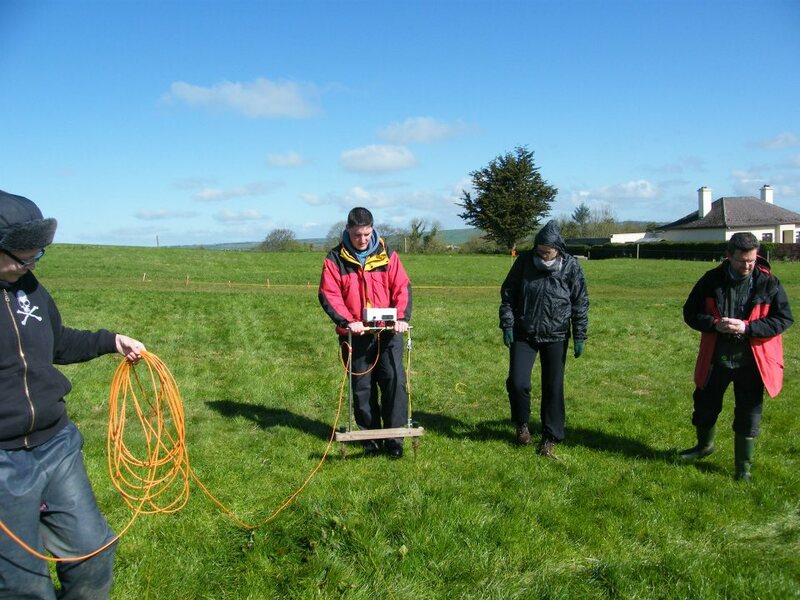 Wednesday the 11 April was started with a Ground Penetrating Radar (GPR) survey. 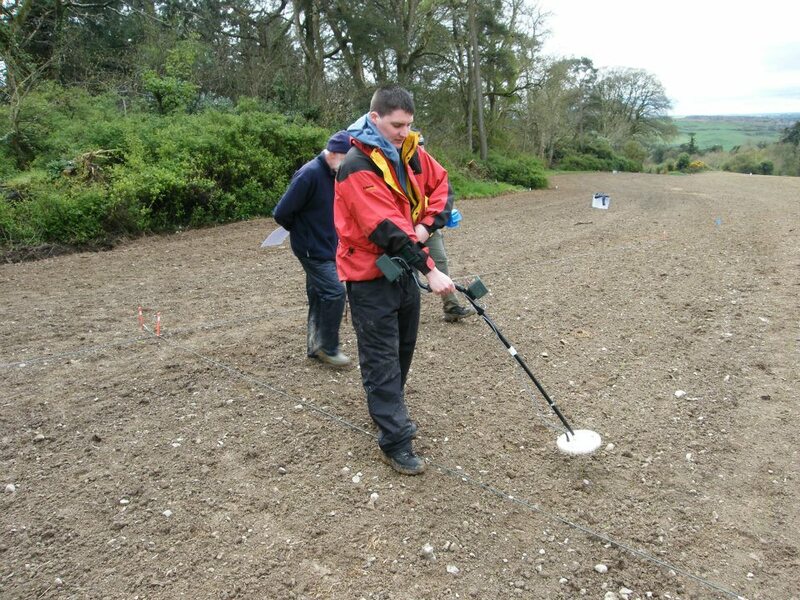 GPR is used to take slices of the earth to identify cuts and ditches and other anomalies. These can then be viewed both vertically and horizontally It is operated by at least two people. We took it in turns to control the operation and to pull the antennae. 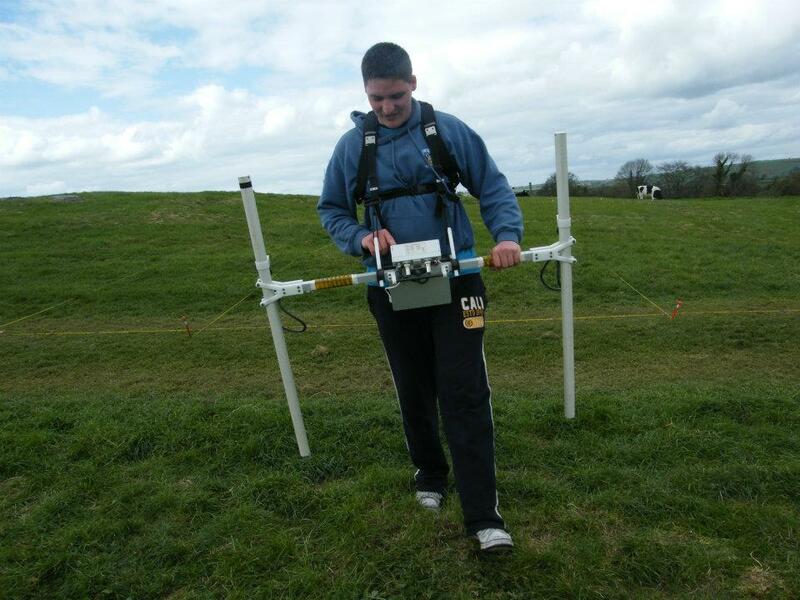 GPR’s come in various sizes which either have high resolution or allow for deeper surveys at the expense of resolution. Thus it is up to the surveyor to decide which is more important. 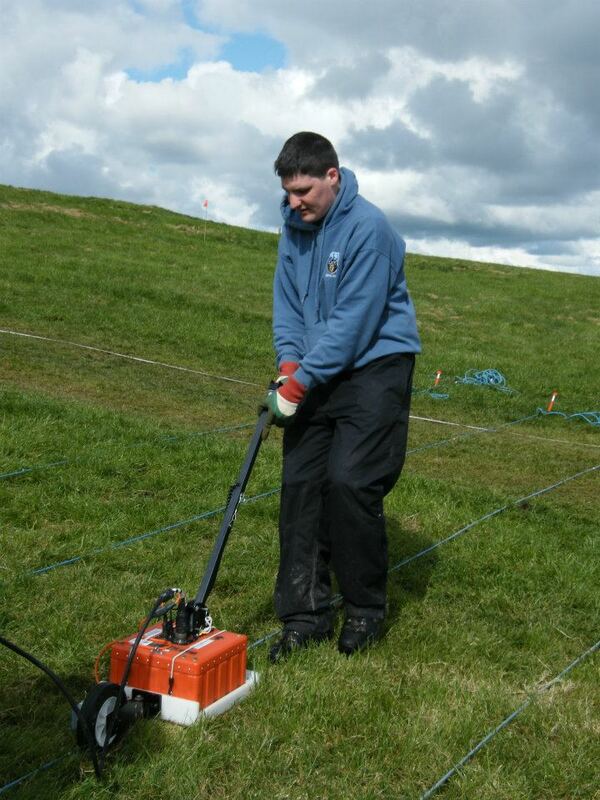 The GPR we were using was a GSSI SIR-3000 GPR which had a frequency of 400MHz. This would provide high-resolution results to a depth of about 1.5m as opposed to a 100MHz GPR which would have a lower resolution but penetrate to depths of 5-20m. Readings were taken spaced at 50cm apart in 20m transects. In the afternoon we were with the Discovery Programme where they demonstrated three of their laser scanners. Laser scanners emit thousands of pulses every second and the distance and time of return is collected to build up a 3-D image of an object or features surface. Control points and GPS are used to fit the scans together in the processing stage. 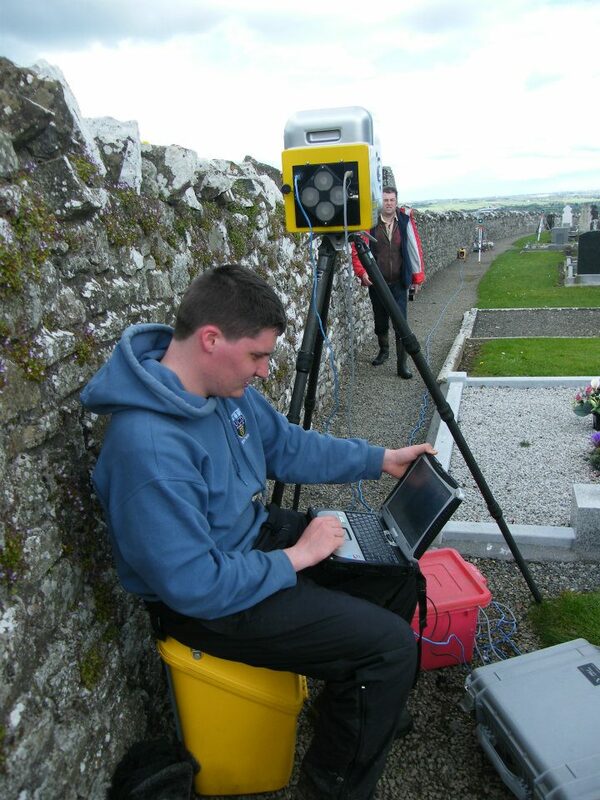 The first scanner was the Trimble laser scanner used to scan a section of the church on the Hill of Slane. This scanner is used to survey large objects such as buildings. It shoots around 5,000 points per second and has a range of about 100m. This was useful as we could see it as it happened on a toughbook. The second scanner was the Faro laser scanner which was used to scan The College next to the church. The Faro scanner is a self-contained unit so once its set up, it collects the points without the need of a Toughbook and so is a less hands on and far quicker method. It is also used to survey large objects such as buildings and emits over 900,000 points per second. Like the Trimble, it uses reference points to tie the scans together to build up a 3-D model. The final scanner was carried out on a decorated panel inside The College. This was a NextEngine object scanner and like the Trimble scanner we could see it as it happened. 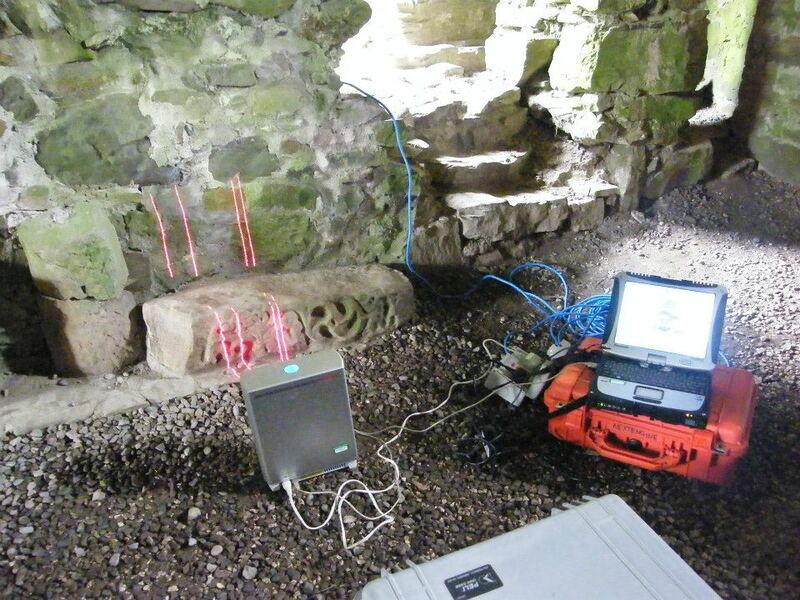 It scans a specific area and is then moved to scan the next area, using overlaps to fit the scans together to form a 3-D model of an object or artefact. The evening brought a display from Kevin on our results from the day and then demonstration on the use of the program Snuffler from Piotr using the results that we had collected ourselves. 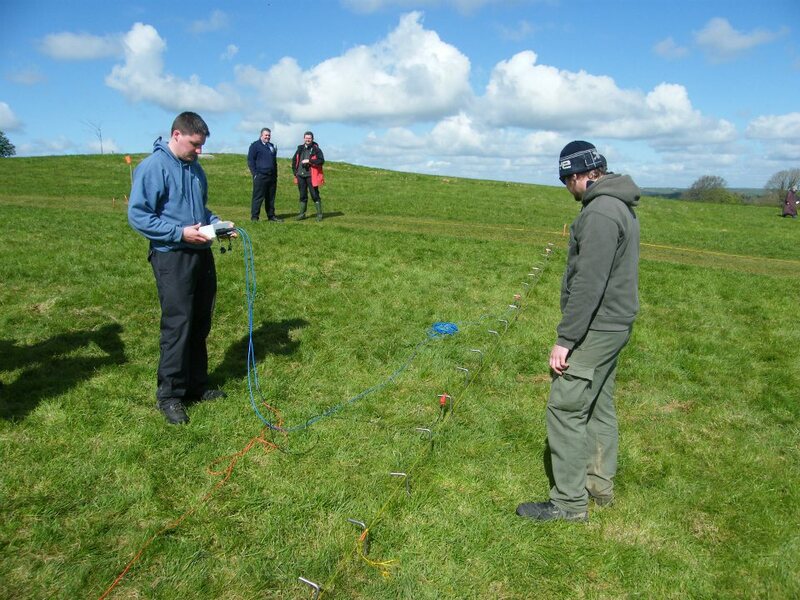 On thursday 12th we managed to complete the earth resistivity survey of our grid which we hadn’t managed to do earlier in the week (see Tuesday above). After this we carried out an electrical resistivity tomography survey. This takes a 2-D slice of the earth to highlight anomalies. It uses probes spaced every 20m and uses the same meter as the earth resistance. Four cables are plugged in to the meter and attached with crocodile clips to four probes at a time. The current is measured on the reading and then the crocodile clips are moved one up. Once the line is complete the clips are brought back to the start and the spacing is increased. We carried this out over the area of the pipeline to a depth of about 1.5m. In the afternoon we carried out the magnetic gradiometry survey of our area. To do this we had to be completely metal free. Luckily it was not raining so our rain gear could be kept off. We used two flux-gate gradiometers, a single and a dual gradiometer. These measure changes in the vertical magnetic field caused by buried objects or areas with a higher magnetic susceptibility (burnt areas) which are higher than the surrounding soil. At first we found a spot which had a reading of zero magnetism. This is harder to achieve with the dual gradiometer as two probes are at work at once. Onc a control had been established, we went to our grid and scanned them at first in parallels lines and then in zig zags spaced at 50cm intervals. We also walked in two methods, one with lines as a reference to provide more accurate scans and one with flags at the end of the grid which was a little more inaccurate. This was to show how the different forms may be able to show different results which vary in accuracy. We downloaded the data into Surfer and had a look at it in the field which showed some excellent results just from the raw data. In the evening we had a demonstration on the use of Snuffler on data from the magnetic gradiometry survey and then a demonstration from Michal from Poland on the use of QGIS to geo-reference low-level aerial photographs and to draw polygons on the geo-referenced images. The final day of the course brought with it a wind down for our group. 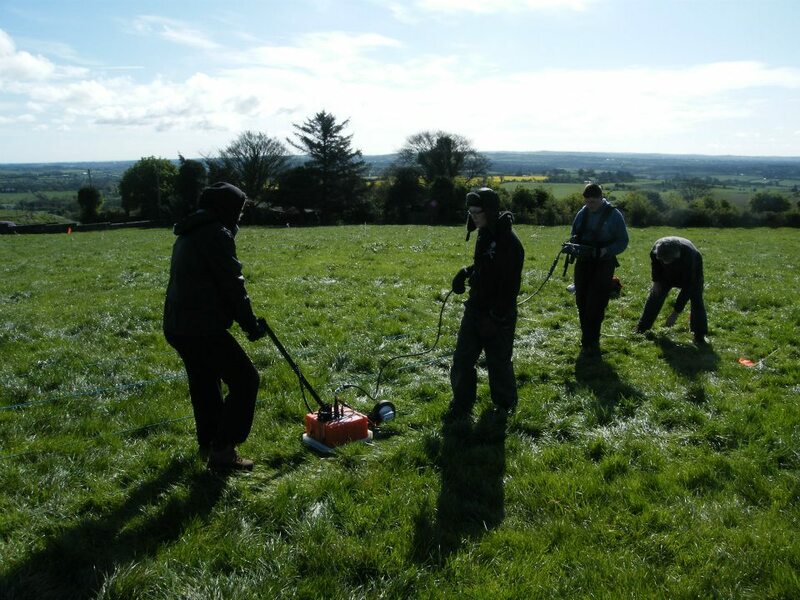 Each group had been assigned either a morning or afternoon free to carry out further work on an area of their choice with the available equipment. 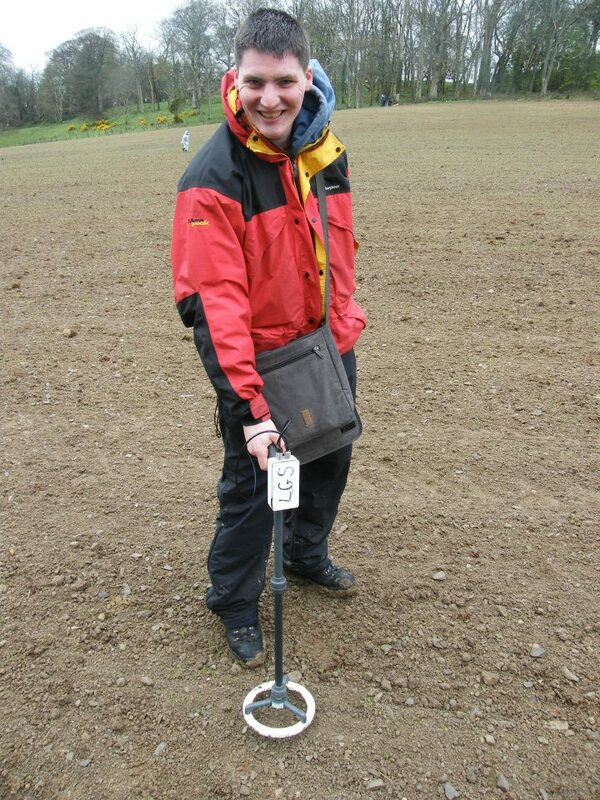 Our free slot was assigned as Friday morning and for this our first task was to mark with a sub-metre GPS the location of all the surface collection and metal detector hits from the first day for the areas of Groups 2, 3 and our own. Groups 1’s area was to be left as they wanted to carry out further work on their area in their free slot that afternoon as they had identified a burnt area and a number of pieces of flint. We took an early lunch so as to finish up early that day. Philip Bromwell from RTE news also visited us that morning and carried out a few interviews and took a few shots of the work being carried out for the 6 o’clock news (here). In the afternoon we got to try out the Low level aerial photography using kites. The platform and the camera had been damaged in a fall earlier in the week so we didn’t get to see this aspect however we got to try out controlling the kite in low winds which was difficult enough in itself. We were also taken through how to construct our own-homemade camera platform by Michal and Asia. In the evening we had an early computer session as we had finished up early. Michal brought us through using the programme Agisoft to build up 3-D representations of images. We were also given a free version of this and demonstrated how to use the full version. This was an excellent course with the perfect balance between teaching and learning by doing. If it is run again it is definitely worth the investment for any archaeologist to go away for this week. It teaches so much and really opens your eyes to what is available to the profession.